Building a royal barge is best illustrated by the construction of the Narai Song Suban King Rama IX Royal Barge, the latest addition to the royal fleet. This royal barge was constructed to commemorate the 50th anniversary of His Majesty King Bhumibol Ayulyedej's ascension to the throne in 1996. The first stage in construction is the design of the hull of the royal barge. This is done by naval architects from the Royal Thai Navy based on the specifications. The design was then subjected to a computer simulation of the hydrodynamics to determine the optimal hull structure. Based on the desired hull structure, the second stage on the construction of the hull commenced. After the skeletal structure was done, panels were added to complete the hull. From here on the Department of Fine Arts took over the decoration of the hull. The intricate designs to be carved on the hull were drawn onto the hull. Sculptors then skillfully carved out the designs in meticulous detail. The artists painstakingly painted the designs. 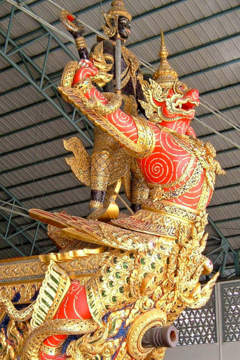 The sculpture of Hindu deity Vishnu astride his Garuda when completed was mounted on the bow. The Royal Household Bureau undertook the fittings and décor of the Royal Pavilion. On completion of the construction, decoration and fittings, the royal barge was blessed through the appropriate religious rites before the official launch. 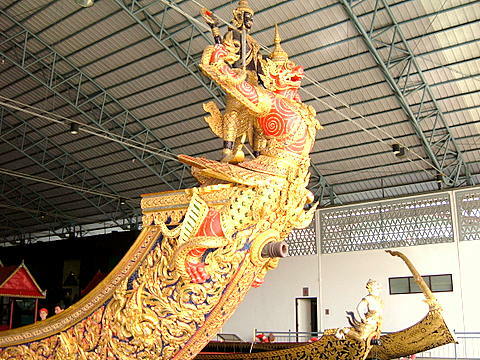 Building the Narai Song Suban H.M. King Rama IX Royal Barge took 200 craftsmen two years. This masterpiece of Thai naval architecture and craftsmanship was launched on 05 April 1996. On 07 Nov 1996 the Narai Song Suban King Rama IX joined the Royal Barge Procession to Wat Arun for the Royal Krathin Ceremony (the presentation of new robes to the monks after the Buddhist Lent). Building a royal barge demonstrates a masterly blend of modern science and technology on one hand and traditional craftsmanship and artistry on the other. This process in building a royal barge is also clearly illustrated in the stages in building a model royal barge, the stages are very similar. Please see model royal barge builder for the details. 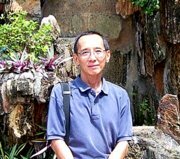 A video showing the construction of the Narai Song Suban King Rama IX Royal Barge is available at the Royal Barge Museum. Please see the map to the museum.